All eight episodes from the second series of the ITV drama starring Jenna-Louise Coleman in the title role. 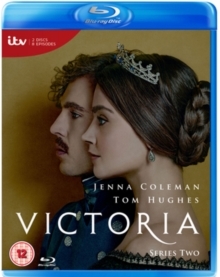 In this series, Victoria returns to her royal duties following the birth of her first child but struggles to find balance in her roles as a monarch, mother and wife. The episodes are: 'A Soldier's Daughter', 'The Green-Eyed Monster', 'Warp and Weft', 'The Sins of the Father', 'Entente Cordiale', 'Faith, Hope & Charity', 'The King Over the Water' and 'The Luxury of Conscience'.